A connected object to assist with marketing! Luseed helps brands assess and involve their audience. It creates and develops interactive and fun experiences using connected objects. 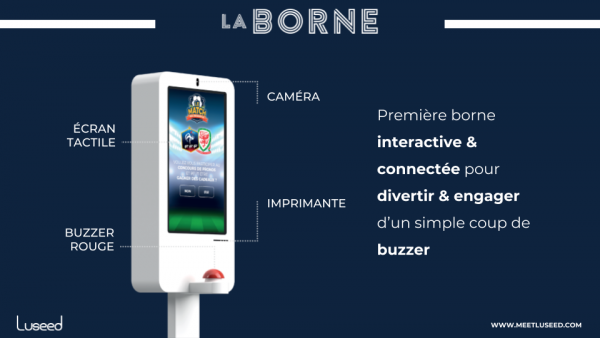 Its marketing solution, LaBorne, offers an unprecedented experience during events by providing the opportunity for users to interact during its key moments (buzzer, selfie opportunity, etc.) The information gathered through these interactions transform audiences into qualified prospects. The two founders, Arthur Burnichon and Clément Aceituno, both avid sports fans, attended several games and were impressed by the quality of experiences offered, both by the clubs and by the brands. Convinced that new technologies, specifically connected objects, enable the creation of even more interactive experiences, they created Luseed to bring their vision to life. LaBorne is made up of three services: an interactive terminal (“borne”) equipped with a buzzer for fun physical interactions; a smart application which helps target the right audience at the right time; and an online marketing tool to assess and stay in touch with the audience. To this day, Luseed has already assisted over a dozen players such as PMU, Total and Paris La Défense Arena with marketing activation on event sites. The Luseed start-up company started its activity by winning the challenge organised by PMU. The two partners pooled their expertise to offer unprecedented experiences to gamblers via an interactive terminal with sports result predictions. This experiment reinforced Luseed’s ambition to take the experience of sports fans to a new level. The company was able to demonstrate the adaptability of the “LaBorne” solution: sports events, trade fairs, retail, company communications, etc. In 2018, it joined the LINCC platform, part of the Paris&Co incubator network, in order to accelerate its development; it also participated in the French IoT programme by La Poste. Luseed was a winner in the French IoT 2018 acceleration programme, and will be exhibiting with La Poste at the 2019 CES in Las Vegas.